Enriched by thousands of answered tickets from our users and partners, we would like to share with you some general knowledge of shorte.st, pieces of which each of you may find useful. Seriously! We will touch upon a variety of topics from I-have-never-tried-it-before tips to payment requirements, so if you tend to ask yourself a shorte.st question from time to time, reading this post will hopefully be beneficial in your shorte.st experience. 1 How can I earn with shorte.st? 2 How can I earn using Referral Program? 3 How can I earn using my website and shorte.st? 4 How do I receive a payment? 5 Why is my payment different from my earnings? 6 Why didn’t I receive a payment via Payoneer? 7 What can I do if I misspelled my withdrawal email and didn’t get a payment? 8 What will happen to my earnings if I haven’t met the limit for a payment yet? 9 What does my revenue depend on? 10 Why can’t I see changes in my statistics? 11 How are my views counted? 12 What will happen if I abuse the system? 13 Why is my account locked? 14 Why have my available earnings decreased? 15 Why can’t I confirm registration? 16 Can you help me solve a different issue? How can I earn with shorte.st? If you shorten your links, you’ll get shorte.st (sh.st) links which you have to share with people. When they click your links, they’ll see ads before going to destination links. They have to click “Skip this ad” to make you earn money. If you get 1000 views, you’ll earn according to payout rates . If you are new to the system, you are probably very open to suggestions where to share your links. First of all, you should use the power of social media. Facebook, Twitter or Google+ are giant communities where people exchange knowledge, experience and links as well. Imagine you come across valuable, funny or shocking content you immediately want to share with others. If you shorten the link to it with shorte.st first, you will benefit from everyone who sees it. It’s called mutual benefit. Your friends help you make a profit and they get something appreciable in return. When posting your content, ask yourself one more question: Is this content “fresh and crispy? ;) Or am I just trying to fool people with something they’ve seen a million times?”. Let me tell you why this is so important. When you prove reliability to your friends and followers by posting hot stuff, they will be more eager to open your links in the future, even if there are some ads on the way. But if they realise that you share old and no longer funny content just to use them and earn, you will lose their trust and they might never visit your links again. You can also try content sharing on forums. Forum communities’ purpose number one is to share knowledge. Some people ask questions, some answer them, others participate passively though they are still very important in the game. If you spend just a little time to solve some of the issues discussed in forums (choose a few of them, but be proactive), you can incorporate short links in your forum posts. When it is done naturally, people will surely understand. However, do not go too far and be careful when adding your referral link (see the next question for details) as the majority of forums do not accept such this and your account might be instantly suspended. So, those whose problem you solve will click your links, but also many others who were just reading and learning without posting a word. How can I earn using Referral Program? There’s an additional earning solution in shorte.st called Referral Program. It’s simply about spreading the word about shorte.st and recommending it to your friends in social media, members of the forums you participate in, your website’s visitors, to everyone. You can add a payment proof to be more reliable and prone to success. If you want to work as our Affiliate, a Referral Program member, you have to share your referral link. It’s on the Referrals statistics page which you can visit just now here. Everyone who registers with this link, will be your referral, and you will earn 20% of what they earn. Your commission does NOT decrease your referrals’ earnings. The offer is unlimited and everlasting. Crazy, isn’t it? How can I earn using my website and shorte.st? If you have a website you can paste our script into it. The script will automatically shorten links on your website. You’ll find the script in the Tools tab -> Website Monetization. Banners work in the exactly same way, you also copy a piece of code from the Tools tab -> Referral program and paste it into your site. If anyone on your site clicks the banner, they’ll go to shorte.st. If they register, they will be your referrals. 1) Have I reached the limit for a payment (PayPal: $5, Payoneer: $20, WebMoney: $5)? 3) Is my PayPal / Payoneer / WebMoney account confirmed, active and capable of receiving money transfers? 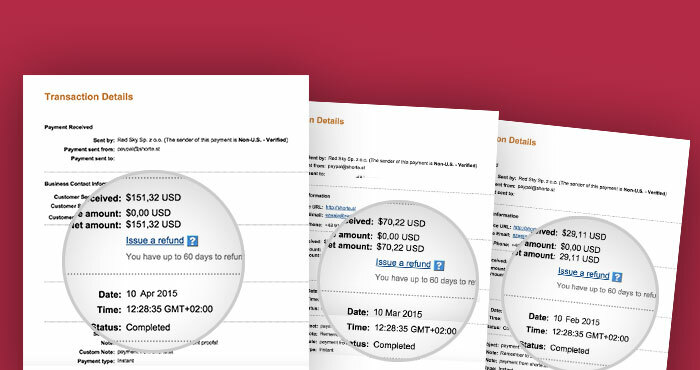 Some accounts require to manually accept every incoming payment before the actual payment is processed. 4) Is it 10th of the month (PayDay) yet? Why is my payment different from my earnings? Shorte.st payments are made according to the billing cycle which is from 10th of the current month till 9th of the following month. In your profile, however, you get every month summed up on the graph. So, if you happen to notice a difference between your earnings in a particular month and the payment you’ve received, visit the withdraw page here. You will see Total own income, Total withdrawn money and the entire Transaction History there. Everything should be perfectly clear now. Why didn’t I receive a payment via Payoneer? Shorteners who withdraw their money via Payoneer need to accept an invitation to a payment by clicking the link sent by shorte.st to their email addresses. The money transfer will be processed successfully only after the invitation has been accepted. What can I do if I misspelled my withdrawal email and didn’t get a payment? If the withdrawal email set in your profile was incorrect or misspelled and you realised that only after the payment’s been sent by shorte.st, don’t worry, your money will NOT be lost. Payment providers usually hold the money for 30 days and if no one claims it within that period, it’ll be returned to the sender. Then, we will be able to resend your payment, but this time to your correct withdrawal email. What will happen to my earnings if I haven’t met the limit for a payment yet? If you haven’t met the minimum for a payment in one month, all your earnings will be accumulated in your account until you earn $5 or $20, depending on the payment provider. We do NOT subtract your earnings from your account. What you’ve earned is all yours! What does my revenue depend on? If there is no product to advertise in New Zealand, the views coming from New Zealand will not be desired and the rate for this country will decrease. However, if, at the same time, there are lots of advertising campaigns going on in Australia, the demand for the Australian traffic will be high and the payout rate for Australia will be on the increase. Why can’t I see changes in my statistics? Our highest priority, since we launched, has been to provide Shorteners with up-to-date, or even up-to-seconds statistics. However, numerous views of shorte.st links occurring at one moment may sometimes result in a virtual queue. Keep calm, all views are counted and updated a second later. How are my views counted? When it comes to paying for your views, we pay for 5 views from a single IP within 24 hours from the very first days of shorte.st. However, some of our competitors, we won’t give away the names, claim to count and pay for as many views as we do, but in fact, they cut about 2 views from every unique IP. Such behaviour is an opposite of treating your business partner fair, don’t you agree? What will happen if I abuse the system? When we treat our Shorteners as serious business partners, we expect mutual respect and we cannot accept activity aimed at abusing our system. This is why we ban everyone who decides on any kind of illegitimate behaviour such as traffic exchange, bots, redirect loops etc. instead of legitimate use of our links. If we find out that a user is a fraudster and sends us illegitimate traffic, which is any of the following actions defined in TOS p. 7-8, we permanently remove the access to their accounts and prevent them from further abuse of the system. If one violates shorte.st TOS, they need to be prepared to face the consequences. Still, if you comply with the rules, as a large number of legit Shorteners who receive thousands of dollars every month for their diligent work and effort, you can grow your monthly budget as they do. Moreover, feel most welcome to share your own payment proof to show the world that shorte.st is NOT scam and get a new referral in return. Why have my available earnings decreased? Referral Program is a great opportunity to increase shorte.st revenues. Unfortunately, it might happen that the person who registers with your link doesn’t obey shorte.st terms and conditions and their earnings come from actions NOT permitted in the system. Accounts of such referrals will be locked and their earning subtracted from their accounts. Consequently, your referral commission will also be subtracted from your account. We are not always able to immediately find out about the actions of abusing shorte.st, so, we reserve the right to execute the aforementioned procedure during the entire cooperation process. Nevertheless, we believe your referrals will refrain from undertaking any actions against shorte.st and your commission will remain in your account ready for withdrawal. Why can’t I confirm registration? Shorte.st emails are scarcely ever marked as spam, but if it happens, for example during your registration, and you aren’t able to receive an activation link, see what you can do. Visit our website and follow the reset your password procedure. Use your email address chosen for registration and once again look for an email in your mailbox. If, despite all your effort, none of shorte.st emails finds its way to your mail account, drop us a line at contact@shorte.st. Our assistants will be happy to help. Can you help me solve a different issue? You can contact us regarding other issues as well. We believe you will make yourself comfortable with our product when having willing-to-assist Customer Service at your fingertips. So, let us know about your questions, thoughts and general feedback if you please, using our Contact Page.